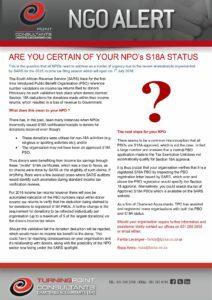 Are you certain of your NPO’s Section 18A Status? This is the question that all NPOs need to address as a matter of urgency due to recent amendments implemented by SARS for the 2016 income tax filing season which will open on 1st July 2016. The South African Revenue Service (SARS) have for the first time introduced Public Benefit Organisation (PBO) reference number validations on income tax returns filed by donors. Previously no such validation took place when donors claimed Section 18A deductions for donations made within their income returns, which resulted in loss of revenue to the Government. There has, in the past, been many instances when NPOs incorrectly issued S 18A certificates/receipts to donors for donations received though:What does this mean to your NPO? The organisation may not have been an approved S 18A PBO. Thus donors were benefitting from income tax savings through these “invalid” S 18A certificates, which was a loss to fiscus, as no checks were done by SARS on the eligibility of such claims. If anything, there were a few isolated cases where SARS auditors would identify such anomalies during standard income tax verification reviews. For 2016 income tax returns however there will now be automated validation of the PBO numbers input within donor income tax returns to verify that the deduction being claimed is for donations to registered S 18A PBOs. A further change is the requirement for donations to be reflected individually per organisation (up to a maximum of 5 of the largest donations) on the donors’ income tax return. Should this validation fail, the donation deduction will be rejected which would mean no income tax benefit to the donor. This could have far reaching consequences on your organisation and its relationship with donors, along with the possibility of the NPO sector now being under the SARS spotlight. There seems to be a common misconception that all PBOs are S 18A approved, which is not the case. In fact a large number are unaware that a normal PBO application made to the Tax Exemption Unit does not automatically qualify for Section 18A approval. It is thus crucial that your organisation verifies that it is a registered S 18A PBO by inspecting the PBO registration letter issued by SARS, which over and above the PBO registration would specify the Section 19 approval. Alternatively, you could search the list of Approved S 18A PBOs which is available on the SARS website. This article was published with permissions from Turning Point Consultants. It may be accessed via: http://www.tpcsa.co.za/website/index.php/resources2/ngo-alerts/34-are-you-certain-of-your-npo-s-s18a-status. As a firm of Chartered Accountants, TPC has assisted and registered many organisations with both the PBO and S 18A status. Should your organisation require further information and assistance, kindly contact Turning Point Consultants offices on 031 208 2458 or email either Farida lavangee (farida@tpcsa.co.za) or Reza Amra (reza@tpcsa.co.za). Related Resource: The ABC’s of Taxes in the Non-profit Sector. NextSo, what is prospect research?